LONG Time ago in a jungle of Java, a tiger was wandering around for food. He hadn't been eating for days. He was really hungry! While he was approaching a small lake, he saw Mouse Deer drinking. The tiger wanted to eat him. Tiger smiled, "Hmmm yummy, finally I get my lunch!" Tiger slowly ducked, crawled, and held his breath. And then..."Gotcha!" said Tiger. He caught Mouse Deer and bit his leg. Mouse Deer was trembling. He was really shocked. But he tried to be calm. He was thinking of a plan to escape from Tiger. He looked around and suddenly he had an idea! He said, "Hey Tiger, I know you are hungry and want to eat me. But the king will angry if he knows you eat me now." "Why? The king knows that I eat meat. I eat animals like you! Said Tiger. Mouse Deer explained, "I guard king's cake. It's very delicious. Only the king and his family eat it. "Mouse Deer pointed at one big, black lump near the lake. It did not look delicious at all. But Tiger was curious. "Don't be fooled by its appearance. Its taste is very delicious. That's why it meant for kings. And you won't get hungry for a month after you eat it. 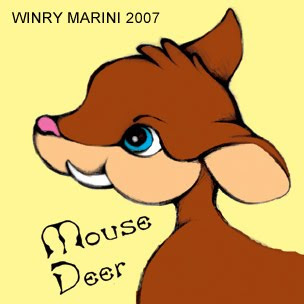 I tasted it once, "said Mouse Deer. Tiger's mouth watered. "Can I taste it?" "Of course you can not The king will punish me like he did when I tasted it last time. He would kill me if something happened to the cake again!" Well...it's all up to you. I eat you or I eat the cake. "Well, then. You don't give me much choice, Tiger. You can have the cake. But first, let me run away as far as I can. By the way, the king won't be able to get me." "All right...Now, go!" He was really hungry. He could not wait any longer to eat king's cake. Mouse Deer took a safe distance away from Tiger. But he still could watch him, as Tiger eagerly took the peace of the 'cake'. Phooey, it's no cake! It's...it's buffalo's dung! I'll get you, Mouse Deer! You! Watch it!" Belum ada komentar untuk "Mouse Deer and Tiger"